Leaves: Mostly alternate above, opposite below, simple, stalked, ovate to triangular, 1.5 to 4.75 inches long, 1 to 3 inches wide, prominent veins beneath, green and appressed-hairy above, finely gray-hairy below; margins coarsely toothed; tips pointed. Inflorescences: Heads, 1-3, terminal, on stalks, showy, 1 to 2 inches wide; bracts narrowly lanceolate, in 2 to several series, loose or weakly spreading, appressed-hairy. 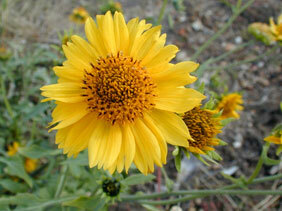 Flowers: Ray florets 10-15, 1/2 to 1 inch long, golden yellow, tips prominently 3-lobed; disk florets yellowish orange. Fruits: Achenes, egg-shaped, flattened, winged, tipped with 2 tapering awns, enclosing small seed. Habitat: Open disturbed sites, waste areas, old fields, cow pens, and roadsides, most abundant in sandy soils. Distribution: Throughout, except northwest 1/4 of Kansas. Uses: Native Americans and pioneers used this plant to treat skin problems and spider bites. The Navajo chewed the petals to bring good luck while hunting and placed the flowers on their homes and in their hair to ward off lightning. Comments: Golden crownbeard yields a strong odor when crushed.